M.Ghibran is among the most talented young composers in the industry today. His work in movies such as Vaagai Sooda Vaa, Vathikuchi, Naiyaandi and recently in Thirumanam Enum Nikkah has floored listeners and he is a name to reckon with in the industry now. Ghibran currently has a couple of big Kamal Haasan films on hand, in the form of Vishwaroopam 2 and Uttama Villain. To make things even more special, the youngster is now set to score music for Kamal Haasan's upcoming remake of Drishyam as well. Though there has been nothing official about the cast and crew for this Drishyam remake, the signs are clearly pointing towards Ghibran to score for the movie and our sources also confirm the same. That makes it a musical hat-trick for Kamal and Ghibran. 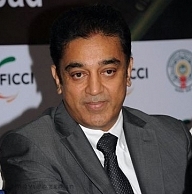 Kamal Haasan's First Time In 20 Years. Kamal And Rajini Together On Screen In Drishyam’s Remake? People looking for online information on Drishyam, Kamal Haasan, M Ghibran, Uttama Villain, Vishwaroopam 2 will find this news story useful.